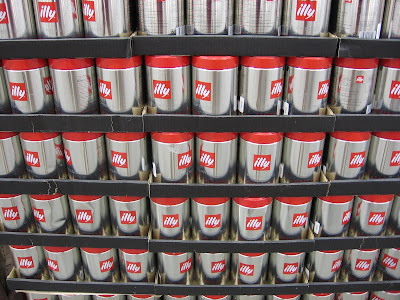 Stacks of my favorite Illy Coffee make my knees weak. After three years as newlyweds on Rue St Denis in Montreal’s Plateau district, Danny and I seemed to make the transition in to suburbia with surprising ease. Within months of discovering we were pregnant, we had bought a family car (translation: Reliable), signed papers for a house, and gotten the necessary Costco membership. Ah, Costco. At the beginning of our relationship, I was reluctant to admit I frequented such a place, but with each visit I found more and more reasons to give it a permanent place in or lives. Now we buy most of our staples there and the best news is it’s only about 5 KM from our house. If you’ve never been, the first visit can be a bit of an attack on the senses: a real crash course to middle class shopping. The things you can buy there are astounding: anything from ready-made omelets to 12-man tents; four-foot high wooden nutcrackers at Noel, to enough edamame to fulfill any vegan's fantasy. If you time it right, (not that I have EVER planned my shopping around some stupid samples…...OK, maybe) you can have a whole meal of free samples complete with ice wine and a breath freshener. Be wary though, some of the samples can be alarmingly bad. I wonder, who BUYS this stuff? It’s good to go with a partner and watch each other’s backs. Danny and I don’t even have to speak to communicate; we seem to have developed these silent codes meaning "Red Alert!!" or "Mmm. Could you manage to score another one?" I can see him veering away from the crab dip with his radar honed in on the nearest garbage can and I know to skip the dip and double up on the chocolate covered blueberries, one for me, one for him. 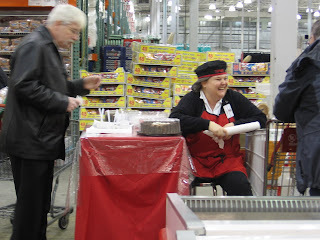 Hmm, looks like this Costco client is taking advantage of the Sample Lady's turned back as she flirts with yet another client. Must be a great way to pick up guys, though. "Hel-LO there, want to try my blueberry cheesecake?" I just wish they would strategically map out the sample people with a little more consideration to the natural order of how things should be eaten. There’s nothing more revolting than nibbling on a dab of cherry cheesecake and then tasting a spear of smoked duck sausage right after. And what's up with ending your meal with breakfast cereal and milk? Come on! If I managed a Costco, I would make this negligence pretty high up on my priority list. It would be like a degustation, (or tasting menu for the blokes) and then you can have the option to buy everything. Yes, start off in the mini quiches and frozen appetizers section, move to the pastas and breads, a little duck or fish here and there, a dab of cheeses, and finish up with some of those gourmet ice creams. I’d team up with some people from Ikea, whoever the wise guy is who paints the arrows on the floor and keeps us all going in the same direction. Come to think of it, I am ALWAYS hungry when I shop at Ikea. Hmm, I can see a merge in the works here. The Costco food court isn’t bad either. 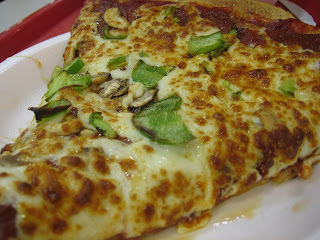 Skip the fries, but the sausages and pizza are pretty good and the ice cream is a good bang for your buck. All this talk and I think I have a shopping list forming. I better check…yep, I knew it, getting low on T.P again. I only have 18 rolls left and I can see the bottom of my 25 gallon drum of olive oil! Wait! I gotta get a case of those energy drinks too! 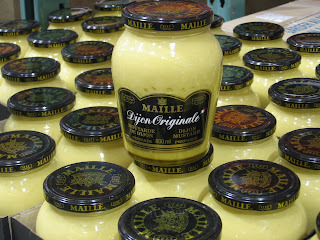 And I am down to my last jar of Dijon. What is it about Costco that you always end up going about a hundred dollars over budget? 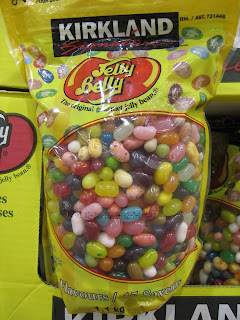 Is it because of that 1.1kg bag of Jelly Bellies you grabbed at the end? The fact that you couldn’t turn down a 3.3 Liter jug of Kalamata olives for $14 bucks? Or was it the 2 dozen roses for $14.99 that caught your eye? Anyway, even if your not a member yet, remember, there are some benefits to getting older, tied down, and suburbanized. I couldn't help but laugh at your recount of a shopping trip to Costco. We go often and also just went this Saturday, and also spent way too much. Funny how we always do that there! 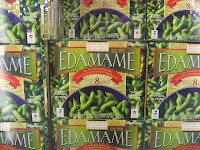 I too noticed the addition of edamame to the freezer section and thought, hmm, should I buy some in this vast quantity to try it for my first time? Probably not the best idea to buy something in bulk when you've never had it before! :) I'll save my first edamame try for a smaller portion. We tend to spend a large amount of time in the book section and often walk away with an armload of novels and fabulous cookbooks. That was quite a hilarious recount... I enjoyed it tremendously. Costco is a little nightmarish for me. I go around and fill my cart. The items are usually non-food, though a few sneak in occasionally. Then I do the same route after deciding that I can actually live without virtually everything in my cart. It's tough - an exercise in will power and antimaterialism. I am definitely an 'out of the closet' Costco fan! Just a hint of the beginning of the word coming out of anyone's mouth who has a membership sets my heart a runnin'! Now, Kevin and I have gotten the married part down, so next was the car and then the baby??? And THEN the Costco membership......whoa! Will power it is Zaak, will power it is! I use Costco in Canada as well and we love it. We have been using it for the last 9 years and found it worth every penny. So glad you guys are here.